Should We Pay Kids to Behave and Do Well at School? 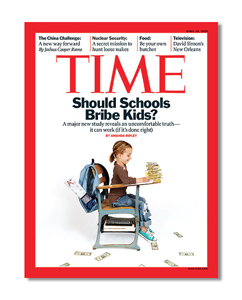 Last week TIME magazine ran a cover story about paying kids cash money to get better grades. The objections to cash ‘rewards’ for schooling have been around for a long time and can lead to tremendous political uproar. There are moral objections—children should do what’s expected of them without reward. There are philosophical, theoretical, religious, and of course financial objections. Parents, teachers and other adults need to realize that it is all very well to hope that an innate sense of moral obligation will cause Jimmy to clean his room or raise his hand in class, but if you want the job done easily and well, then you need to pay with currency that kids value. What do kids really want for reinforcement? How can we possibly find out? Social worker Lynn Loar PhD decided to ask them. The simple answer was candy, for one thing; money for another. But it’s more complicated than that, as these kids explain in an article published in the the Summer/Fall 2009 issue of the Latham Letter. The article is authored by Lynn Loar and five young co-authors.